Draw My Thing is a famous social interactive game where players take turns in drawing a picture of a given word or guessing the word based on the drawn picture. The game is available in the iOS and Android markets, but also in popular web gaming centers such as Yahoo! Games. According to Compete.com, the producer’s site, omgpop.com, had 1 million monthly active users on average lately, but the game’s numbers are rumored to be higher. Part of the success is due to the simple concept on which the game is based. Many players want to check how great they are at drawing cartoons on a virtual board, or at guessing words based on what others are drawing. The app produces revenue by selling virtual goods to its users. For a small amount of cash, players can customize their crayons or they can unlock additional benefits and tools available in-game. OMGPOP was founded in 2006 by Charles Forman, needing around 6 years to reach the wild success that Draw My Thing is seeing nowadays. Its investors include SoftBank Capital, Spark Capital and Bessemer Venture Partners. In March 2012, Zynga agreed to buy OMGPOP in a private transaction rumored to be around $210 millions. Geocaching.com is an outdoor treasure hunting game. The site offers several quests in the form of GPS coordinates in order to encourage players to explore their neighborhood and locate hidden containers, called geocaches, using GPS-enabled devices and then share their experiences online. The company behind the service, Groundspeak, was founded in 2000, and since then, their community has grown steadily upwards. The site attracts nowadays around 300’000 unique visitors each month. The original founders were Jeremy Irish, Bryan Roth and Elias Alvord. They’re now located in Seattle, USA. Geocaching is a hobby for millions of people, combining high-tech GPS devices, a natural instinct for exploration and outdoor physical activity to create the perfect fun for a weekend exploration. Couples proposed, engaged, got married and shared this common passion for decades, to name just a few of the things geocaching facilitated across the years, as you can see in the video below. LiveScore.com offers scores from recent sport events, updated in real time as they take place. On the site’s main page users can find soccer results from matches taking place today, and by using the links on the sidebars, users can navigate to past or future matches from the current week, or to results from other sports such as hockey, basketball and tennis. For each match the site presents information such as the current time in the match, who’s playing and in what minutes was the score previously changed. The site focuses on soccer and succeeds in being fairly comprehensive in this area: it includes more than 50 countries for which it presents up-to-date results from their soccer national leagues and cups. For the other sports, it includes in a similar manner comprehensive results about the most important current events. On average, LiveScore attracts around 100’000 monthly unique visitors. This success is in no small way due to the reliability built into the site: no matter if it’s day or night, people can find most of the time the score they’re interested in, up to the current minute of the match. The domain was registered in July 1998; nowadays it earns most of its income by hosting betting ads from third party publishers. The legality of these online betting services came into question lately in some countries. The evolution of the law in this area might impact in the future the revenue and sustainability model of LiveScore as a free service, but for now it seems to be live, opened to the public and up to date, 24/7. 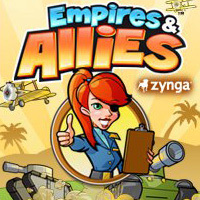 EmpiresAndAllies.com is the newest Zynga game. Launched on 31st of May 2011 (17 days ago), the game has over 10 million users. The game combines CityVille, the previous Zynga top social game built upon the Facebook platform, with a turn-based strategy combat simulator featuring campaigns and locked missions which can be unlocked as the player progresses throughout the game. To advance quickly to the next levels, the so called “empire coins” are required. These are given at the beginning of the game in a small quantity, but as the game evolves, players need real cash (USD) to procure them in order to advance their cities. Zynga is a company renowned for its metrics – they measure everything that has to do with user engagement and satisfaction, and they social engineer their games to maximize the number of friends from your Facebook account that you bring into the game. This tactic is easily understandable, economically speaking; in this game, it can cause some interesting allied fights with the enemy, so the game is at least worth a try for those that never played a Zynga game before (and it’s a must try-on for CityVille or FarmVille fans).